I think 4/27 is Panoply weekend here in Huntsville. I can almost guarantee we’ll go under a tornado warning that weekend at some point. 4/27 is also the National Cornbread Festival in South Pittsburg, Tennessee. I prefer that event over Panoply. Looks like the front should clear in time for Dega but we’ll see in about 5 days. May be a refreshing day to watch cars go fast. Xfinity may be Monday or better yet before the main show. Alabama is #1 in the country this year in #tornado count. The last time Alabama led the nation was (no surprise) 2011. 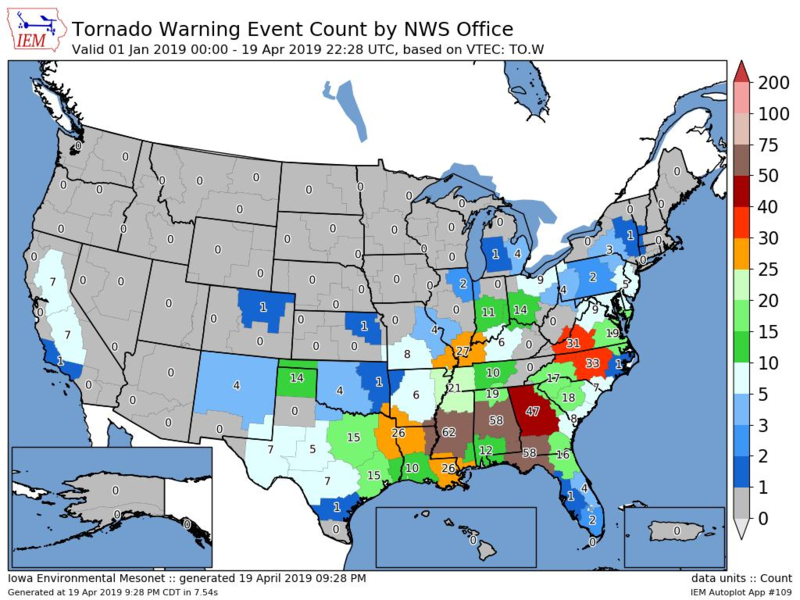 Nearly one quarter of all tornadoes in the United States in 2019 have touched down in Alabama. Think about that for a second...1 out of every 4 tornadoes this year have been here. Next threat for tornadoes will be late Thursday into early Friday. From March 14 through a couple weeks ago, we were at state record territory too; was the most prolific tornado year on record in AL for a couple weeks. "How would any of you explain to the general public Dr. Forbes/TWC TORCon scale, vs how the rest of us who know what it takes to forecast tornadogenesis via model data, experience, AFD's, and SPC analysis, etc.? Most of those I have tried to explain TORCON just seem to live or die by TORCON? This may not be an answer, but personally, I think a number system would be much easier for the public to understand. Although, I don't think it needs to go all the way to 10, maybe 0-5. Yep. Like I've said before, while you definitely don't want to see catastrophic tornadoes where people are killed and entire towns are destroyed, a sleepy pattern isn't ideal either. I've said it before, but since I got into severe weather in the fall of 2014, 2016 has been my favorite severe season hands down. An active season* with way more amazing supercells and tornadoes than you can count (including some flat out beautiful tornadoes in February) and very few deaths or injuries? That's a rarity, and I hope there are more seasons like that in the future. 2008 and 2010 were also amazing seasons from a chaser's perspective, but they had higher death tolls. *The official tornado count for 2016 was a bit below average, I know, but the wind and hail reports were above average, and there were a lot of brief/weak tornadoes that the NWS offices never seemed to document. Counting those ones, I would guesstimate that the 2016 tornado season was near-average or slightly above average overall. Are we done with Severe weather in Dixie for a while? Cause if so we really deserve it. Yea, it looks like we won't have anything to track for at least a week and a half or so. It certainly appears that way. In May the tornado count takes a nose dive. There is nothing really all that interesting in the long range right now. Beside the occasional pop pulse storms it may be over for the most part. Just wouldn’t go all out and say quiet Done just yet in Dixie ... but things should start migrating bit north ... think midsouth like Tennessee Arkansas Kentucky areas going have some action towards end this month into early part May. What’s the system coming through the South next Thursday-Saturday with a chance of thundershowers? I know that the severe weather pattern moves north and west in May. However, I hope the pattern is not so active over Kentucky the second weekend of May that I have to cancel my trip to Mammoth Cave. On the plus side we are moving towards Plains season, which usually means more photogenic and less deadly storms. I found this graphic from the Iowa Enviromental Mesonet group interesting. January 1st until now.